Active since 2007, with this aptly-titled & wickedly-illustrated full-length album serving as the long-overdue follow-up to 2013's "Powerdose", Speedtrap is a Finnish five-piece that is based in Lappeenranta and perfectly fronted gritty lead singer/veteran metalhead Jori Sara-aho (Death Toll 80k, Scent of Flesh, ex-Irritate, ex-Marttyyrioperaatio, ex-Nailgunner, ex-Skullfuck, ex-Crippler, ex-Hooded Menace, ex-Neutron Hammer (live), ex-Deadarlings). 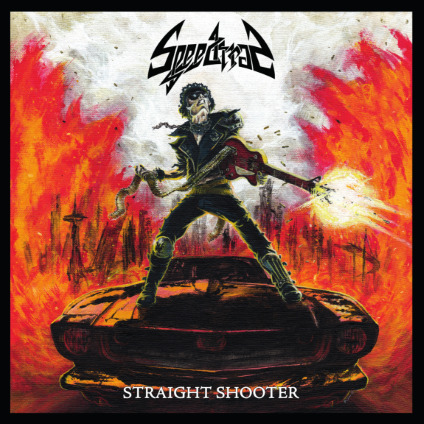 With 8-tracks in all and a run-time that is just over 33 minutes, "Straight Shooter" is not only Speedtrap's long-awaited follow-up to the praise-worthy "Powerdose", but it is also this band's 2nd overall full-length release. Have no fears though. There is no need to worry about this album's content or overall sound. As far as sophomore albums go there is absolutely no slumping going on here! This one is every-bit the sweet charmer that "Powerdose" was if not slightly better! On a previous occasion I called this woefully-underrated band a "speed metal version of Motörhead" and while a part of that description still rings true there is no denying how much this band has changed between album number one and album number two. A lot of that has to do with Speedtrap's two new members* and the fact that one-time bassist Markus Hietamies (Forced Kill, Stench of Decay, ex-Pyrotoxic, Hard Action, ex-Circle) has taken over drum duties for the departed Miika Keränen. As we just mentioned the drums how about if we start there and then we can work our way towards the front (ie: the sick guitar riffs!) of this hard & heavy/speed metal band. Much like Speedtrap's lead singer Jori Sara-aho, Markus Hietamies is a talented multi-instrumentalist and he easily makes the jump between instruments. He comes across as a natural in his new profession and he sounds as if he has been playing that part for Speedtrap since day one. What's more his drumming on "Straight Shooter" makes for an improvement in that area of the band especially as Speedtrap has now added some N.W.O.B.H.M./80's metal to the mix! And that of course brings us to new guitarist/one-time Ranger member Jaakko Hietakangas. Jaakko joins six stringer Ville Valavuo (Death Toll 80k, Death with a Dagger, ex-Pyrotoxic, Hard Action, Perikato, ex-Circle) and seeing as Speedtrap is now armed with two guitarists there are a lot of dual-leads going on with "Straight Shooter". His arrival has resulted in more than a few Judas Priest moments on Speedtrap's latest, but it's not as if this slick band's love for Motörhead has suddenly withered up and died. It just adds another wrinkle to what was already Speedtrap's wicked cool sound and it gives this Finnish band more of a classic metal vibe. Chances are if you liked this band's debut album then you will like "Straight Shooter". If you are new to this act then picture a beefed up Judas Priest with a nice slice of Motörhead and a flavorful side of 90's speed metal. You can pre-order the album digitally by going here and while you are there be sure to check out the album's title track/fist single, "Straight Shooter". *Speedtrap has a new second guitarist in Jaakko Hietakangas (Initiated, ex-Damnations Pride, ex-Deathraiser, ex-Ranger, ex-Steel Machine, ex-Swallowed) and Antti Salminen (ex-Cast Iron, ex-hooded Menace) takes over bass duties now that Markus Hietamies is behind the drum kit.